The Pontifical Institute of Christian Archaeology in Rome (PIAC) is launching a new semester course from February to June of 2017. 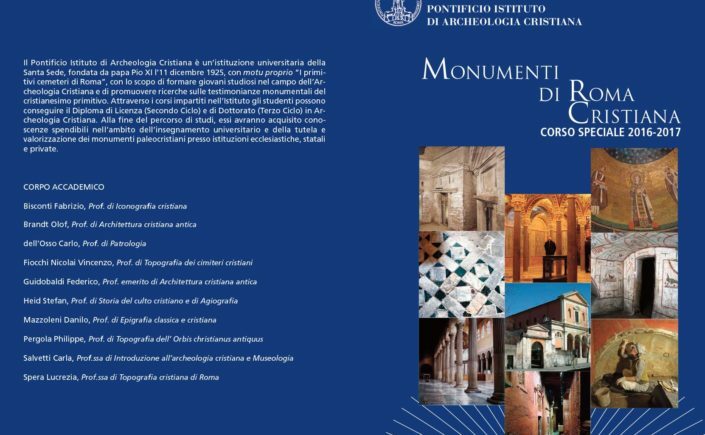 Concentrating on the "Monumenti di Roma Cristiana", the course alternates classroom instruction with on-site study of ancient Jewish and Christian archaeological sites, including visits to the Jewish catacombs of Vigna Randanini, the Christian catacombs of Domitilla, Pretestato, Priscilla, and Saints Pietro and Marcellino, the Vatican's "Santa Rosa" cemetery, the paleo-Christian churches of San Clemente, Saints Giovanni and Paolo, San Giovanni in Laterano, the Lateran Baptistry, Santa Maria Antiqua, and the collections of Jewish and Christian artifacts in the Vatican Museums and Cloister of Saint Paul's Outside the Walls. The language of instruction is Italian, but the course is open to all at the undergraduate or graduate level in any discipline or major. Most meetings are on Saturday with occasional Thursday and Friday lectures. Course credit is available (25 CFU) based on attendance and the outcome of an exam in June. 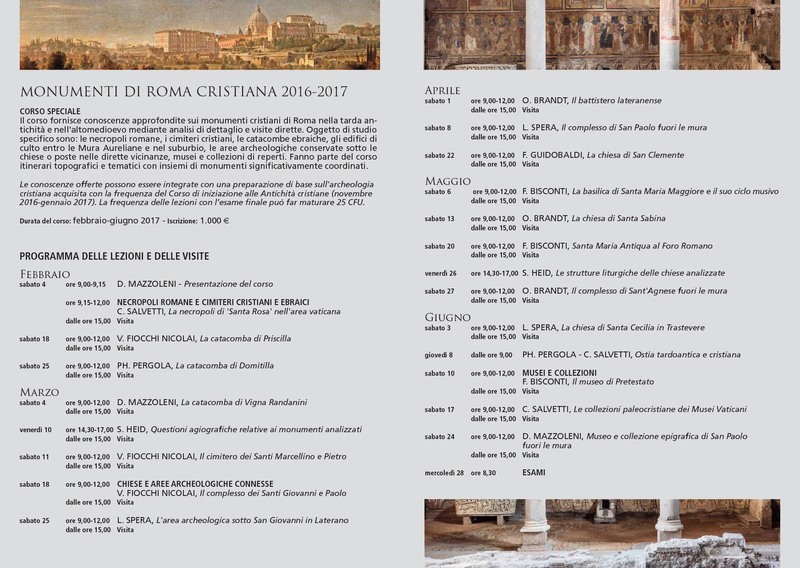 This course is designed to compliment the "Corso Speciale di Iniziazione alle Antichita' Cristiane'", also held at the PIAC from November 2016 to February of 2017. 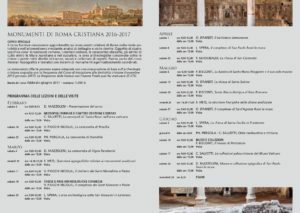 Following more or less the same schedule of weekend lectures and study tours, this introductory course in Christian Archaeology includes visits to a variety of archaeological sites, including the catacombs of via Dino Compagni on the via Latina, the Coemeterium Maius on the via Nomentana, and the necropolis of Isola Sacra at Fiumicino. Tuition for one or both courses includes entrance fees into the sites. The courses may be taken together, or separately. The "Initiation" course also assigns free passes for participants to visit other catacombs in Rome and around Rome. For more information about registration and the 2016-2017 schedule, contact the PIAC administration at www.piac.it. Flyers for the programs are below. The PIAC also administers full-time Baccalaureate, Licentiate, and Doctoral programs in Christian Archaeology for graduate students with prior work in the field. These courses are competitive to enter, with a deadline in October for admission. Tuition includes all fees for a yearly week-long study tour. A limited number of scholarships are available to international students for the PIAC graduate degree programs.